Historic Johnson Farm is a history and heritage education museum owned by Henderson County Public Schools that includes the oldest brick house in Henderson County. 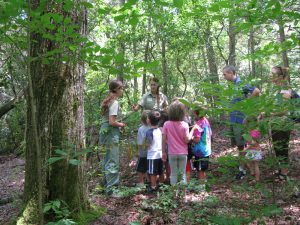 School field trips, historic home tours, nature trails, picnic tables, animals and 10 historic structures on 15 acres of forest, fields, and streams are a few of the activities available to visitors. The Farm is listed on the National Register of Historic Places and has been designated a North Carolina Cultural Treasure. The grounds of Johnson Farm are open to the public Monday–Friday, 8:00 am- 4:00 pm. Tours of the farm house are given at 10:30 am. Visitors are welcome to walk the grounds, visit the animals, and take the audio tour on their own. The Farm follows the Henderson County Public School schedule of holidays and closings. Weekend tours and tours at other times during the week are available by appointment only for groups of 10 or more. For information about holiday closings, check out our calendar. The Heritage Weavers and Fiber Artists (HWFA) occupy the 1920s boarding house at Historic Johnson Farm. HWFA is dedicated to preserving the Appalachian fiber crafts needed to support a frontier homestead in Western North Carolina. 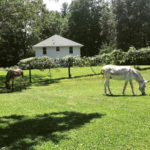 A visit to HWFA studio and gallery is included in your farm tour. Their gallery/gift shop is open Mon-Fri, 10:00 am – 4:00 pm. They also offer a variety of classes and study groups throughout the year. To find out more about membership or classes visit their HWFA website, www.hwfawnc.org or call 828-595-9475.